Rubber Room Ramblings: EMBELLISHED EVENTS FOR THE HOLIDAYS! This is another Holiday Stamp-A-Stack card for the Rubber Room September 26th get together. Since customers make eight cards on a Stamp-A-Stack night in the Rubber Room, I try to keep my Holiday Stamp-A-Stack cards easy to make but still keep them full of lots of texture and layers and fun! 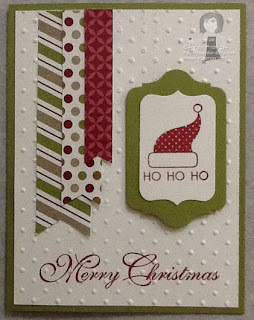 For this card I used some of the Season of Style Designer Series Paper from the Holiday Mini Catalog. The card base is Old Olive and the ink is Cherry Cobbler. 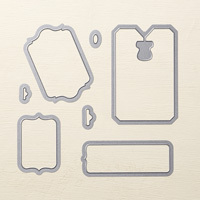 The stamp comes from the Embellisehed Events stmap set and the sentiment comes from Greetings of the Seasons Stamp Set. I used the Chalk Talk Framelits for the Big Shot to cut the image and the backing for the image. This little card just seems very "fun"! RSVP FOR THE SEPTEMBER 26TH HOLIDAY STAMP-A-STACK HERE!